Keeping your roof in top operating condition requires a little maintenance each year. The small amount of time and energy spent can save you thousands of dollars in repairs from a major water leak into the home. Below are four important tips to consider when inspecting and maintaining your roof. The attic will offer the first clues that there are leaks in the roof. Look for holes made by roofing nails, areas of insulation that have gotten wet and any mold growth. For better results, do the inspection during a heavy rain. You can also have someone spray water up on the roof using a garden hose. If you do see drips of water, follow the trail to see where it is coming in at. Water can enter in one area and run down beams to another area of the attic. The gutters and downspouts are designed and placed to move large amounts of water down off the roof and away from the building. The wind from storms and heavy rain can cause a lot of leaves and small branches to clutter the roof. They may disappear from view as quickly as they appeared. You might be hopeful that they blew away, but chances are a large number of them probably made their way down into the gutters. This can lead to a clog. Blockages are easy to spot during rainstorms. Water will begin pouring off the side of the roof in areas. These clogs will have to be physically removed. Check these areas twice a year and make sure they stay free-flowing. A drip edge is a material that runs the perimeter of the roof edge. Missing pieces can result in wind-driven rain accessing areas of the roof and eaves, rotting the wood. Replacing wood in these areas has to be done by a professional and can be expensive. It is easier to simply maintain the drip edge and keep these areas dry. Items that come up through the roof leave areas that are vulnerable to water intrusion. Vents and chimneys are the most common. 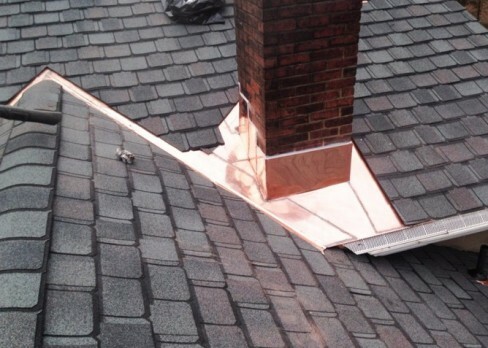 Thin sheets of metal called flashing are typically attached around the perimeter as a water barrier. Failure in the flashing attachment leads to major leaks. Check these areas and use a sealant, or replace the flashing if it appears weathered and worn. Contact roofing specialists like South Shore Roofers for all of your roofing Hanover MA maintenance needs today!